ACROSS the shimmering, new suburban rooves of Springfield Lakes, a church on the hill is taking shape as beacon for a rapidly growing community. 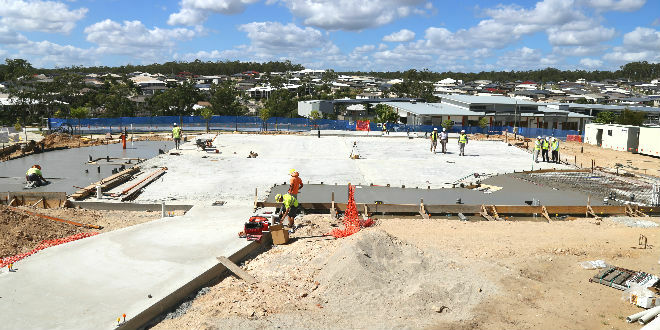 The concrete slab has been poured at the Our Lady of the Southern Cross, and work is progressing at a fast pace. Wearing a hard hat and hi-visibility vest, parish priest Fr Mauro Conte was brimming with enthusiasm as he watched workmen trowel and level the area which will become a sanctuary, and where an altar and ambo will stand. “Work started in the middle of February and is going really, really well,” Fr Conte said. For the past six years, Springfield parishioners have worshipped in a hall at St Augustine’s College, with a packed Sunday-morning congregation reaching 450 to 500 people. A Saturday-night vigil Mass in the hall regularly attracts 200 parishioners. Grand Designs: Images of how the new church will look when it’s finished. 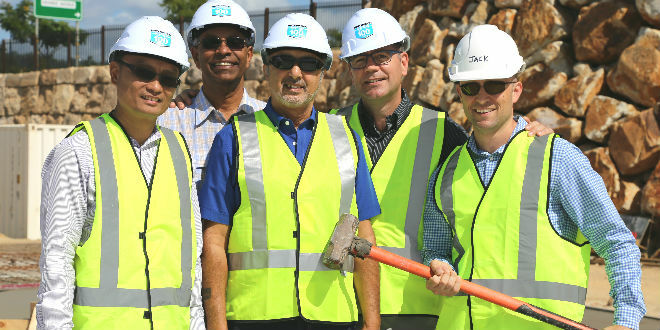 “We have dreamed of having a church,” building committee chairman Vim Balachandran said. He is one of the prime movers in a multicultural parish, which boasts 20 nationalities. The project has been on the drawing board since the Springfield Catholic community was established in 2011. The church building committee is “very excited” about the architectural design for the new church which explores the theme of heaven and earth, and will feature a complete wall of glass, marble tiles and about 70 square metres of mosaics. 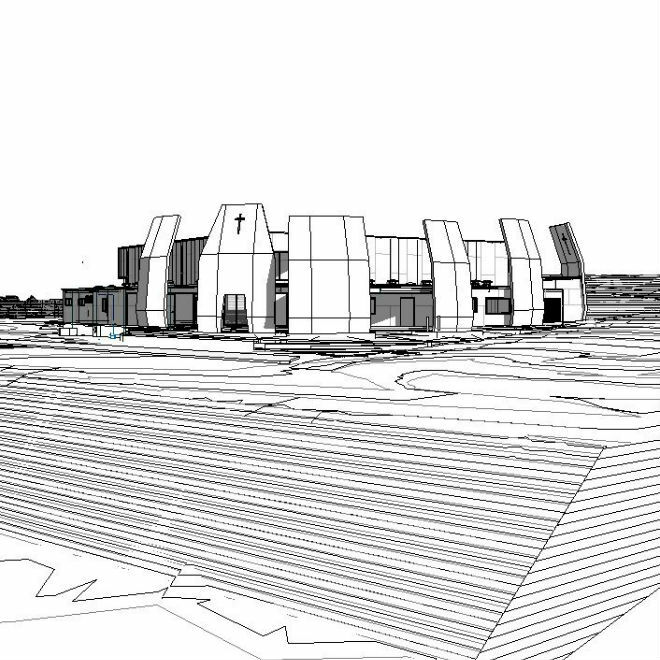 The church is designed along an east-west axis, and will feature an easterly view to the rising sun. Fr Conte travelled to Italy to order the key feature materials, and during his visit convinced noted artist and theologian Fr Marko Rupnik to produce the mosaics and to paint the glass depicting nine scenes of the life of Mary. Each of the scenes will cost $6000. In progress: Builders get busy laying the foundations of the new church in Springfield Lakes, with the growing suburb in the background. Fr Rupnik is the creative man behind the Jubilee of Mercy logo and he is known for his bold, colourful icons featured in churches and sacred spaces around the world. Fr Conte is enthused and optimistic that many new parishioners will be attracted to a new and inspirational place of worship. “It will be an attractive church – even if people come and have a look and visit,” he said. 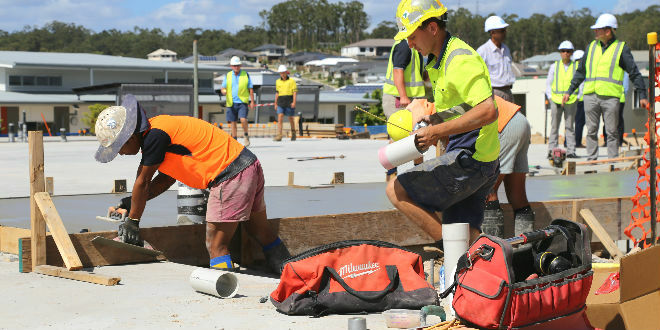 Greater Springfield, a collection of five suburbs, has a population of 32,000 and is set to grow rapidly in the coming decades. “This is a vibrant, young multicultural community full of optimism and possibilities,” Fr Conte said. The enthusiasm of the Springfield Catholic community is embodied by the efforts of church volunteers, who regularly travel to Suncorp Stadium to man a popular sausage sizzle. “It’s our main fundraising effort,” Fr Conte explained. “Every game, every concert, we are there selling sausages from St Thomas More Church (in the Jubilee parish). “Last year it brought in around $57,000, and we’ve been doing it for three or four years now. Fr Conte is keen to widen fundraising efforts across the entire archdiocese. He said as well as the $6000 price tag for each of the nine Life of Mary scenes, $1200 would sponsor a church pew, while a brick in the new church would cost $100. Next: What’s this couple’s secret to being married for 60 years?